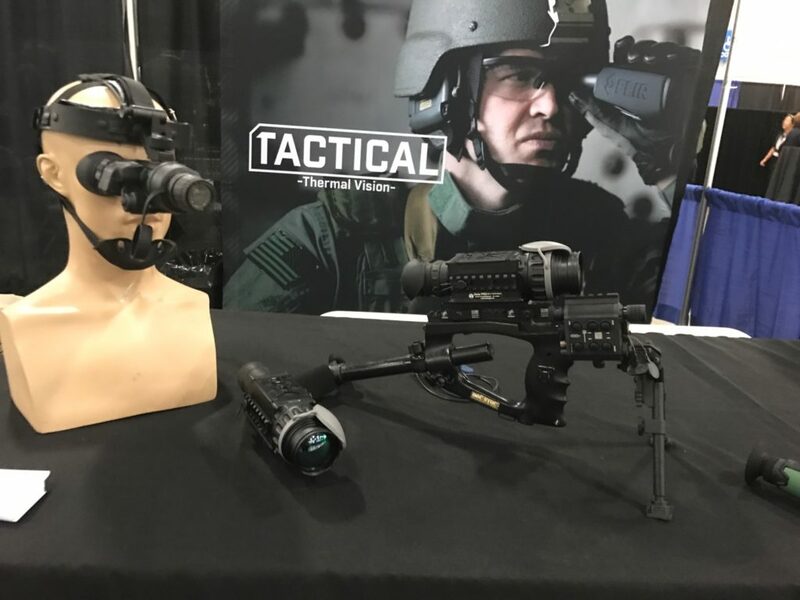 Last night, the Berkeley Police Review Commission voted 4 to 2 to cease the city’s participation in the highly militarized Urban Shield war games and weapons expo. The decision will be passed as a recommendation for the city council to make a decision on. The date for when the Berkeley city council will discuss this recommendation has yet to be decided. Berkeley – Seven people who were brutalized by the Berkeley Police while demonstrating against Berkeley’s participation in the highly militarized Urban Shield policing program filed a claim against the City of Berkeley today. On June 20th, 2017, the seven turned out to a special Berkeley City Council meeting at Longfellow Middle School to speak against Berkeley’s continued participation in Urban Shield, an annual SWAT training and weapons expo. 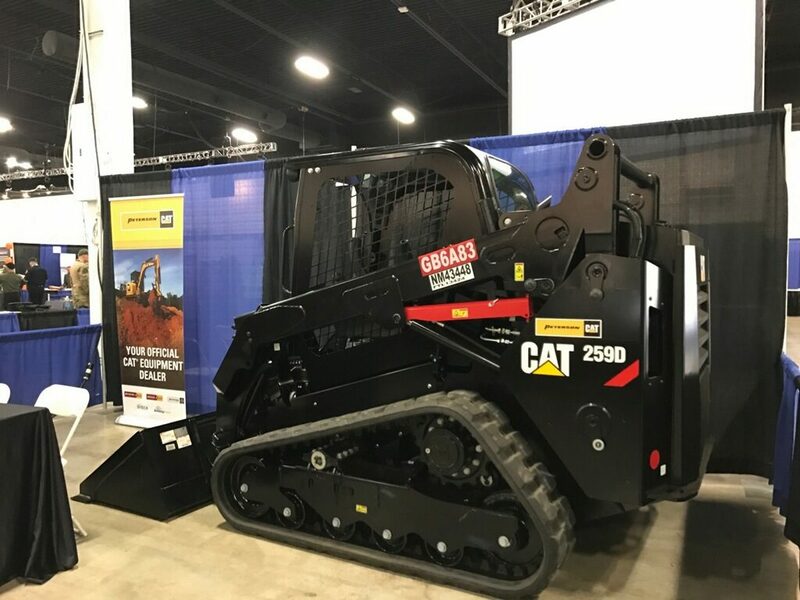 They were among hundreds of people who gave hours of public comment in opposition to Urban Shield, but the Council proceeded to rush a vote in favor of continuing to participate. When activists peacefully unfurled a banner reading “Stop Urban Shield, End the Militarization of our Communities,” they were immediately attacked by Berkeley Police officers. The officers grabbed two people, applied excruciating pain holds and arrested them without giving them any chance to leave. Police then forcibly pushed the crowd out of the auditorium and into the street. When people continued to express concern for the two who had been arrested and chant in opposition to the violence of Urban Shield, the police advanced on the crowd aggressively, wielding their batons. 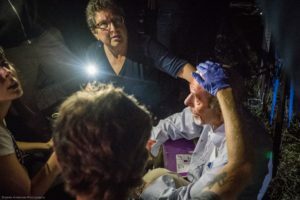 Police clubbed Lew Williams, a 73-year-old retired elementary school teacher on the head, causing him to bleed, and struck minister Sharon Fennema, a Berkeley resident and professor at Pacific School of Religion, on the shoulder. A photojournalist was hit multiple times on her arm, which was already injured and in a brace, and her camera was forcefully shoved into her face, bruising her. Police clubbed other protesters repeatedly, even as the activists showed no threat. Although several Berkeley officers were in close proximity to Mr. Williams, not one officer offered first aid or called an ambulance. Other demonstrators assisted Mr. Williams, who suffered a concussion as well as a laceration on the top of his head. Nor did the police provide any medical attention to the two people who had gratuitously been subjected to pain holds. Dylan Cooke sustained lasting wrist and shoulder injuries as a result of this mistreatment. During the Council meeting, the Berkeley police chief boasted of how Urban Shield offers valuable training on de-escalation.Yet, just hours later when faced with a nonviolent, peaceful demonstration, police immediately resorted to escalation and violence. 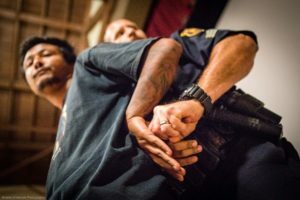 Only a few months prior to this June 20th incident, BPD agreed to changes in its First Amendment and Use of Force policies and training, as a result of a federal civil rights lawsuit and a two year Police Review Commission (PRC) process arising from BPD’s response to Black Lives Matter protesters on December 6, 2014. In that eerily similar incident, a Chronicle photographer and a minister were hit on the heads, protesters were indiscriminately clubbed from behind, and BPD used batons to forcefully herd demonstrators from the campus area all the way across the city border into Oakland. Civil rights attorneys Jim Chanin and Rachel Lederman, who brought the prior lawsuit and are representing the claimants here, contacted Chief Greenwood after the June 20 incident to try to discuss the event, but the Chief never responded. The government claim filed today is a prerequisite required before the activists can sue the City of Berkeley in court. 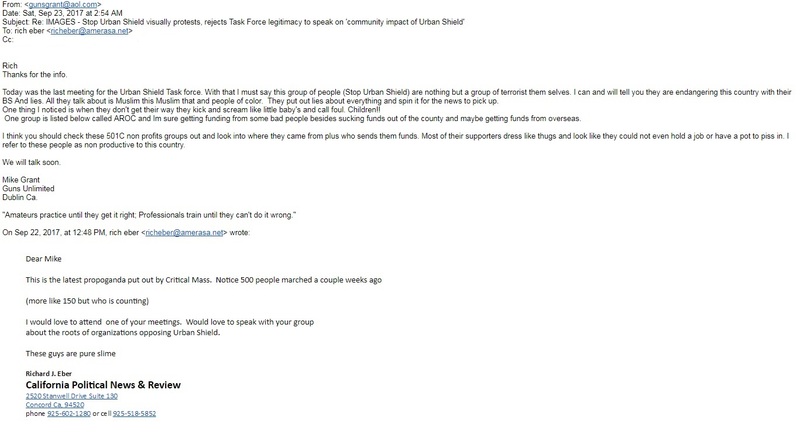 In an email to one of the Stop Urban Shield representatives on the Alameda County Urban Shield Task Force, Mike Grant of Guns Unlimited referred to the Stop Urban Shield Coalition as a “group of terrorists.” Grant was Supervisor Haggerty’s appointee on the Task Force. 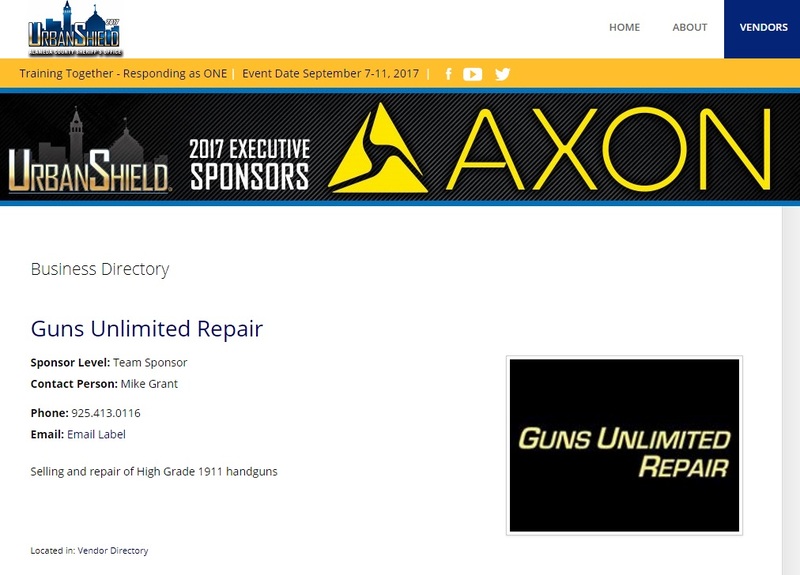 He disparagingly dismissed concerns of Islamophobia and racism, and went on to accuse the Arab Resource and Organizing Center – a member of the Stop Urban Shield Coalition – of “getting funding from some bad people” and potentially “getting funds from overseas.” Grant’s Guns Unlimited is an endorser of Urban Shield. 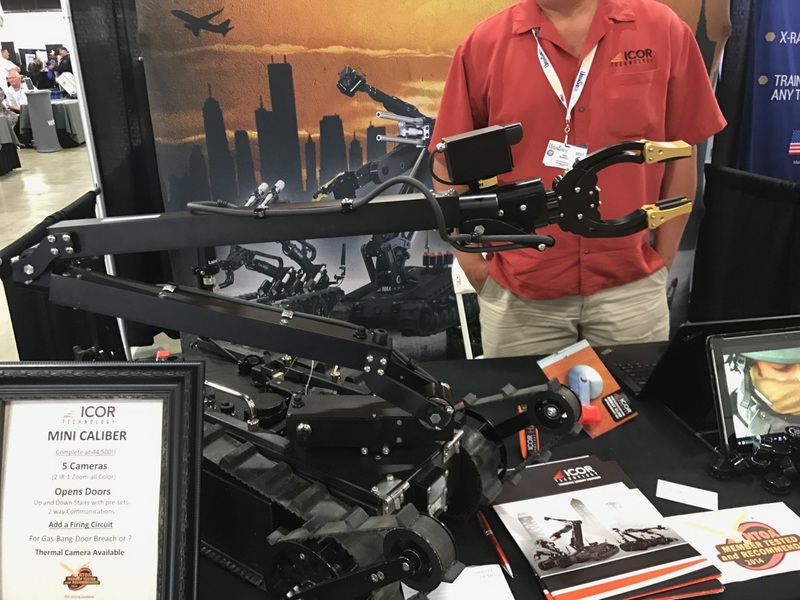 See below for images of today’s weapons exposition. 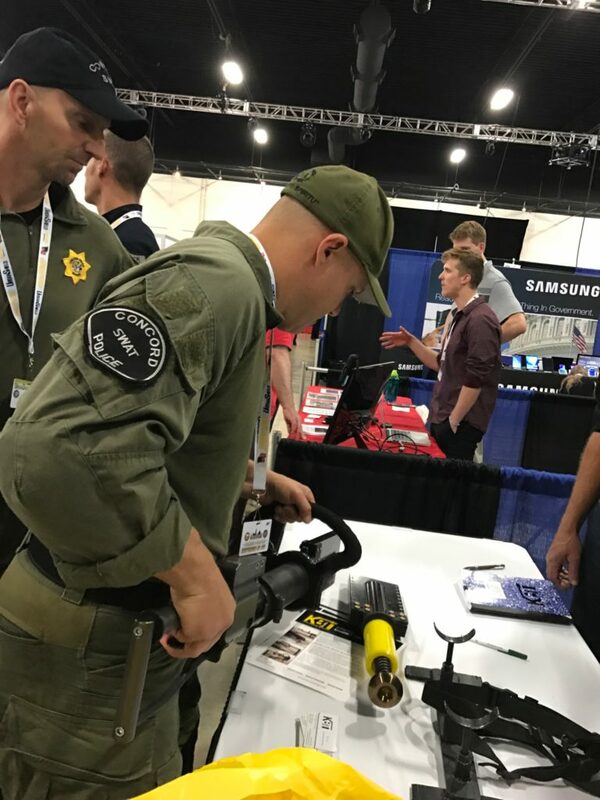 As part of Alameda County Sheriff Ahern’s annual and highly controversial Urban Shield program, hundreds attended a weapons exposition and vendor show in Pleasanton this morning. Observers reported vendor tables selling new facial recognition software that will be piloted in Alameda County’s Santa Rita Jail this year, “mile high” sniper rifles that will be featured in this weekend’s training activities, heavy duty batons used for crowd control, surveillance drones, weaponized robots, and close range rifles. 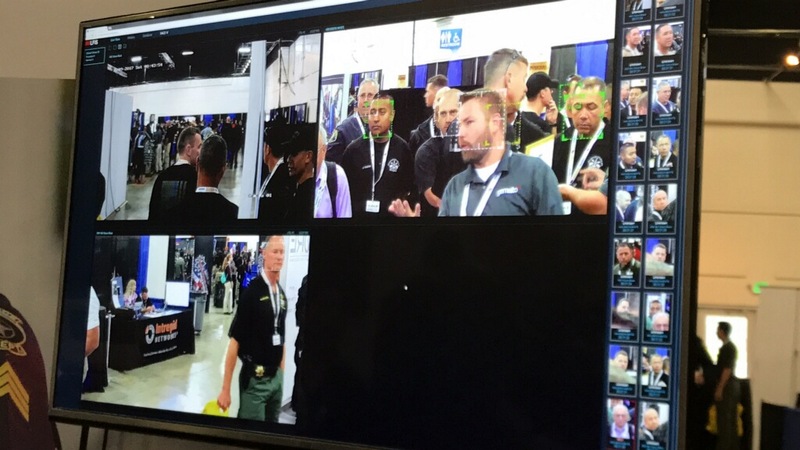 Law enforcement agents – including representatives of San Francisco Police Department, Oakland Police Department, Berkeley Police Department, California Department of Corrections and Rehabilitation, Department of Homeland Security, and Alameda County Sheriff’s Department – shopped for military style weaponry, surveillance technology, robotics, and armored vehicles. 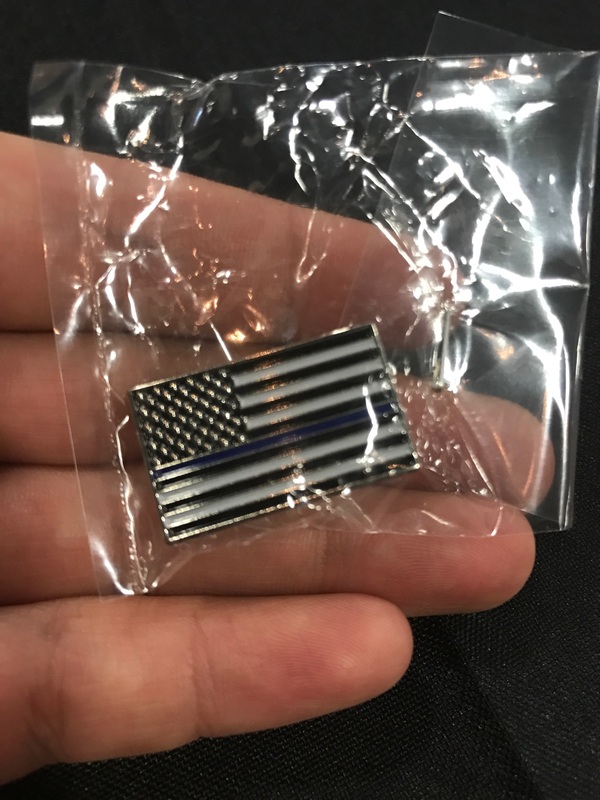 Participants were also given “Blue Lives Matter” pins, a slogan that many have condemned as dismissive to the issue of police violence raised by the Black Lives Matter movement. The vendor show and SWAT competition brings together law enforcement from across the country and the world to train in war games simulations and scenarios that have a “nexus to terrorism.” Urban Shield proponents’ claim that the event’s emphasis is on emergency preparedness rang hollow as the expo overwhelmingly featured vendors of weapons and surveillance technology. 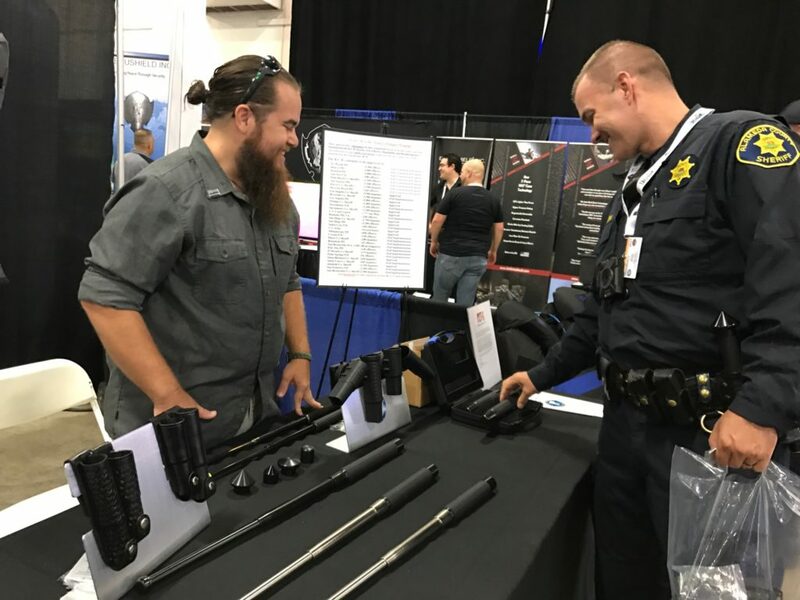 Though Alameda County Board of Supervisors prohibited weapons sales at this year’s vendor show, interested parties were able to place bids with vendors and obtain weaponry within as little time as two weeks. Over 15 of today’s vendors donated weaponry and equipment for police participating in this weekend’s SWAT competition to test out the weapons. 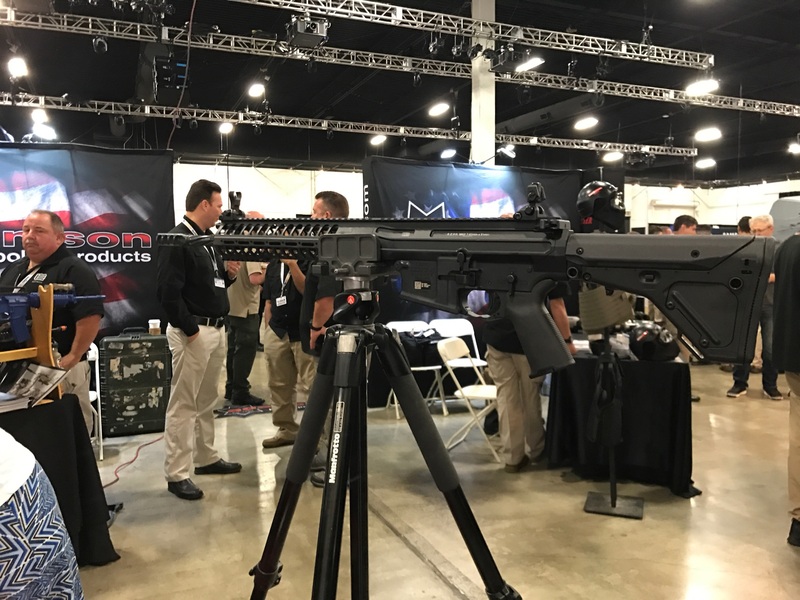 Due to mounting community pressure to cancel Urban Shield, members of the Alameda County Task Force on Urban Shield as well as elected officials have been allowed to attend the weapons expo and SWAT competition this weekend. 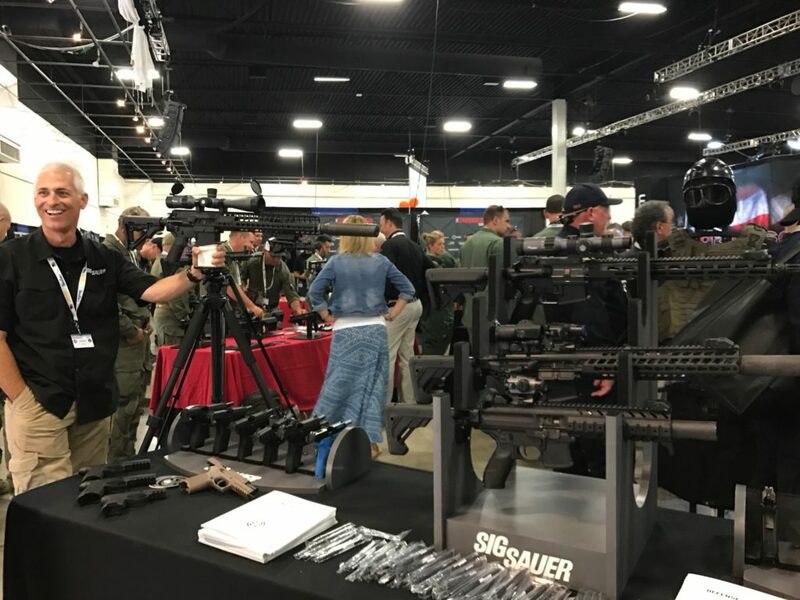 Observers at the weapons exposition today included Berkeley Mayor Jesse Arreguin and Councilmembers Cheryl Davila and Lori Droste, as well as Stop Urban Shield coalition representatives from the American Friends Service Committee and Ella Baker Center. 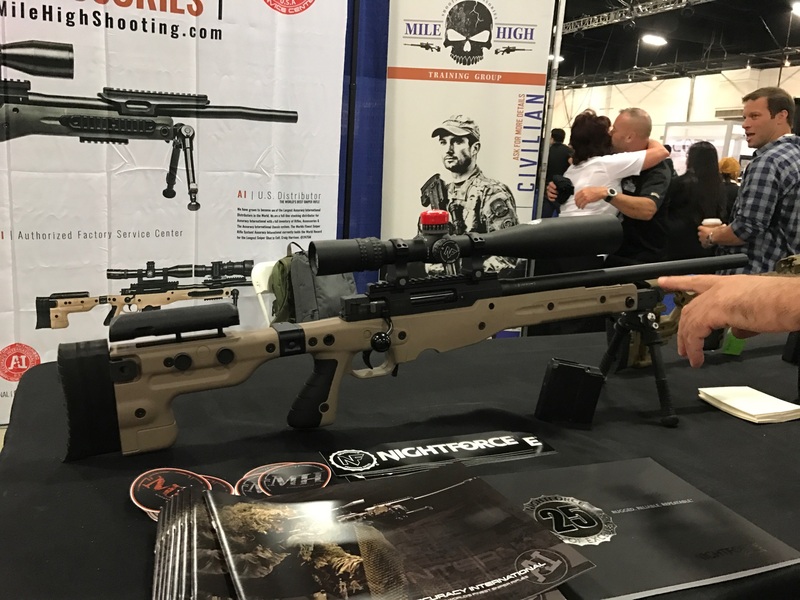 “Seeing the weapons exposition first hand was horrific. 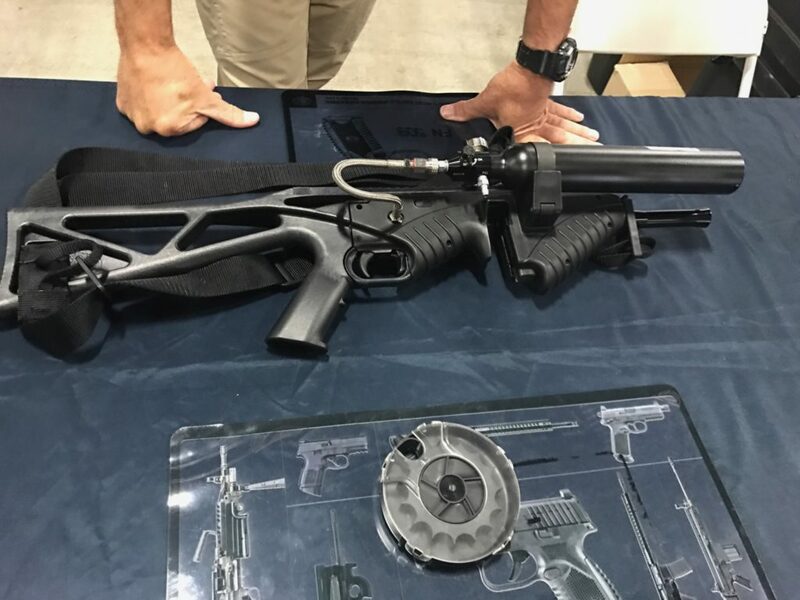 The testimonies from SWAT victims and community members that we have been highlighting for years came to life as we watched Bay Area police departments window shop for new military-style weapons,” reported Tash Nguyen of the Stop Urban Shield coalition. “This is exactly why we have been demanding an end to Urban Shield,” she continued. Nguyen serves on the Alameda County Task Force where the Stop Urban Shield coalition has made proposals that would address the militarized nature of Urban Shield and the impact on communities of color in the Bay Area. 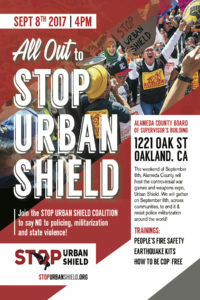 Hundreds of Bay Area residents are preparing to gather outside the Alameda County Administration Building today at 4pm to demand that the Board of Supervisors immediately end Urban Shield. 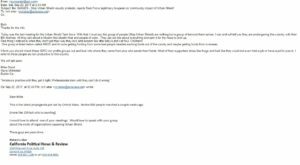 Stop Urban Shield organizers are also planning to hold a resource fair at Lake Merritt after the rally, aimed at providing workshops, aid kits, and information on how communities themselves can respond to emergency situations without militarized law enforcement. 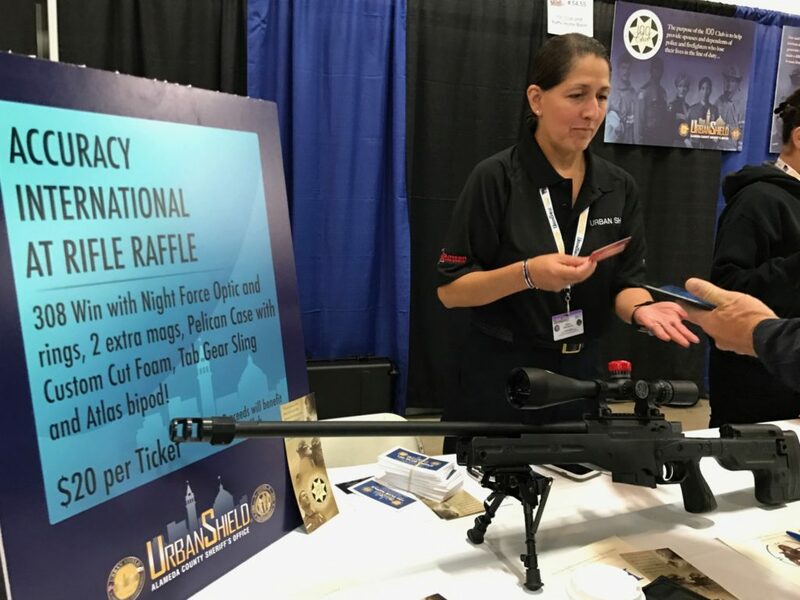 This rifle is being raffled off for $20/ticket to raise funds for the 100 Club. Any attendee can purchase a ticket. Concord Police asked if this tool for violently opening doors could be used on a person. The vendor responded that it would tear through the person’s heart. 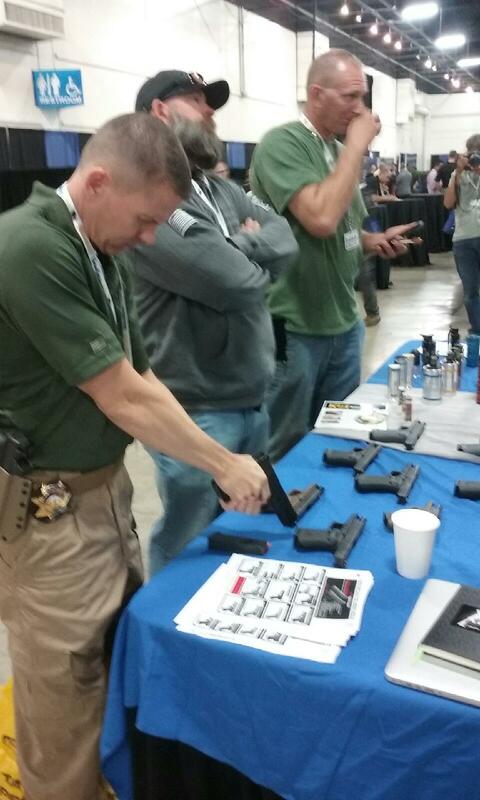 This “less lethal” weapons is used to forcefully remove people from a jail cell. 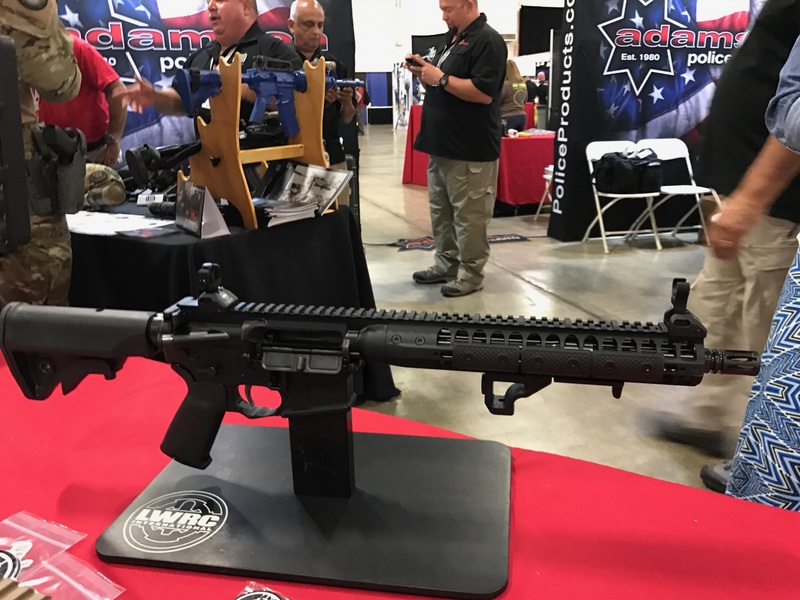 Alameda County Sheriff’s Dept has this weapon. Continue the Fight against Fascism – Stop Urban Shield! This weekend we won a victory against white supremacy, powerfully united in the thousands across communities, to kick fascists off the streets of San Francisco and Berkeley. Despite police collaboration with the alt-right and the targeting of counter protesters, we stayed together and kept each other safe against both the police and the white supremacists. In the days following, with Berkeley Mayor Arreguin calling to label antifa a gang and the media reframing our mass mobilizations as violent, we will stay united and continue to fight back against fascism and oppression. We know that these emboldened acts of white supremacists are symptomatic and fundamentally connected to state violence and police militarization. We must bring the same unity and mass power that we did in the streets this last weekend to the ongoing local struggles against policing, militarization and violence. 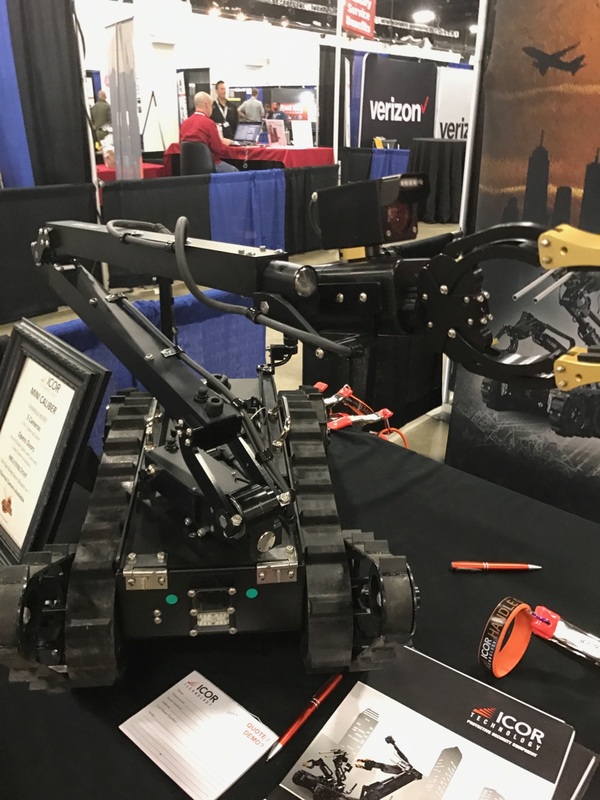 In the aftermath of last weekend, we look ahead to the weekend of September 8th when Alameda County Sheriff Ahern will once again host the militarized and xenophobic Urban Shield weapons expo and SWAT team training. This is the same Sheriff who endorsed Jeff Sessions, is working on the Santa Rita jail expansion, collaborating with ICE, and most recently whose office retweeted white supremacist Richard Spencer. Urban Shield is exactly the kind of training that prepares Berkeley Police to collaborate with the alt-right, to criminalize counter protesters, to racially profile Berkeley residents, and to use military grade weapons and equipment in everyday policing. SEPTEMBER 8TH 2017: ALL OUT TO STOP URBAN SHIELD!!! 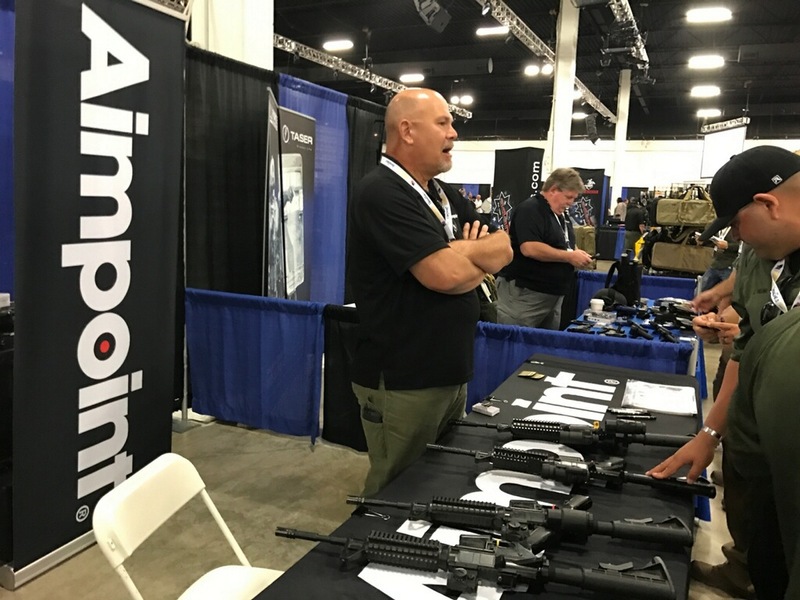 The weekend of September 8th, Alameda County will host the controversial SWAT training, war games and weapons expo, Urban Shield. We will gather on September 8th, across communities, to end it & resist police militarization around the world! Join the Stop Urban Shield Coalition to say NO to policing, militarization and state violence! With the current manifestations of violence under the Trump administration, it is more important than ever to urge the Alameda County Board of Supervisors to end this racist and Islamaphobic event and invest in emergency preparedness that benefits the health and wellbeing of our communities. While Urban Shield is just one front in the fight against the state’s attempt to militarize every aspect of our lives – from its war-making here and abroad, to the increasing presence of police in our schools, to the systemic murder of Black and Brown people at the hands of police – stopping Urban Shield would be a major victory against this growing trend of militarization in cities everywhere, from Oakland to Ferguson to Baltimore. 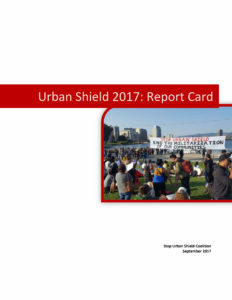 Stop Urban Shield is a broad coalition of grassroots community and social justice organizations united in the fight to end Urban Shield and hold accountable our cities and counties for their corroboration in increased racialized repression and violence. Join us in resisting violence against our communities and in fighting for genuine visions of justice, safety, and self-determination. Oakland – Yesterday at around 10:40pm, the official twitter account of the Alameda County Sheriff’s Department retweeted a video of a press conference organized by Richard Spencer, the icon of the white supremacist “alt-right” movement. The tweet dubbed the press conference with a “Unite the Right” hashtag – the same slogan that white supremacist groups used to mobilize people to Charlottesville, VA this past weekend, which resulted in the tragic murder of an anti-racist demonstrator by a white supremacist. Community organizations that have long organized against the Sheriff’s department harmful policies and practices argue that the endorsement of white supremacy on twitter is representative of the department’s ongoing attacks against immigrants and people of color. Community members fighting police militarization with the Stop Urban Shield Coalition, anti-imprisonment organizers with Decarcerate Alameda, and immigrant rights advocates with Alameda County United in Defense of Immigrant Rights (ACUDIR) all condemn not just the message of the retweet, but the ongoing racism and violence of Sheriff’s Department against impacted communities. “As appalling as it is that a public entity in the Bay Area would retweet a well-known white supremacist, we are not surprised. The Alameda County Sheriff’s Department, under the reign of Sheriff Gregory Ahern, has consistently pursued policies that align themselves with extreme hate, racism, and xenophobia,” said Woods Ervin of Critical Resistance and the Stop Urban Shield Coalition. “If county officials are appalled at the Sheriff’s Department retweet of white supremacy, they need to take action and put an end to its equally racist and appalling practices and programs, such as Urban Shield, immigrant detention and collaboration with ICE, and jail expansion. The Sheriff’s Department annually hosts Urban Shield, the largest militarized SWAT training and weapons expo in the world. 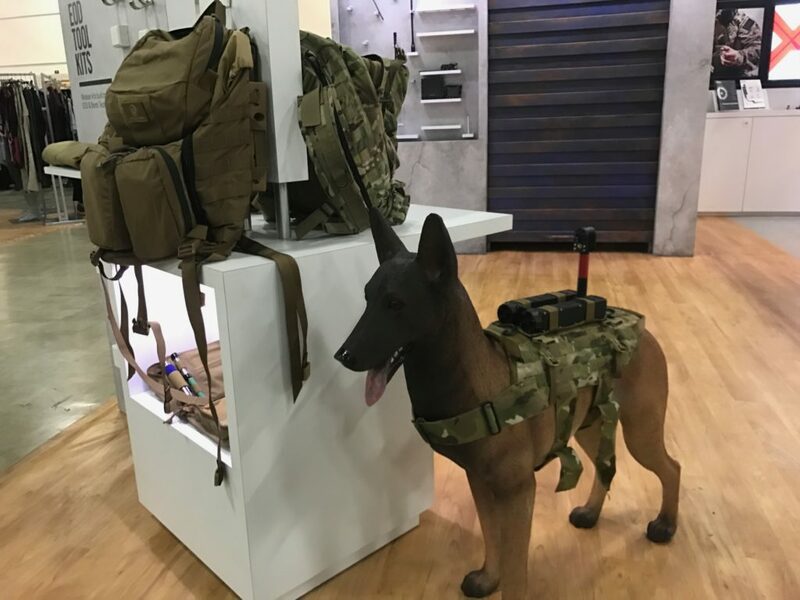 Federally funded by the Department of Homeland Security, Urban Shield has been under sharp criticism due to its promotion of police militarization, Islamophobia, anti-Black racism, and highly repressive practices and techonologies. Bay Area communities have also been outraged at the Sheriff’s Department’s plans to expand the county jail system, as well as its continued collaboration with Immigration and Customs Enforcement, where it detains immigrants, ultimately leading to deportation. This is not the first time the County Sheriff has been under scrutiny for his support of the extreme right. In December of last year, Sheriff Ahern also co-signed a letter of support for Jeff Sessions, the current U.S. Attorney General who has been widely condemned because of his xenophobia, racism, and denial of climate change. “The Sheriff can claim that the retweet was a mistake, yet he continues to steamroll our communities with violent and racist practices. We demand County officials to take action not only against his words or tweets, but on his actions that are having real, everyday impacts on communities of color throughout the Bay Area,” said Ervin.